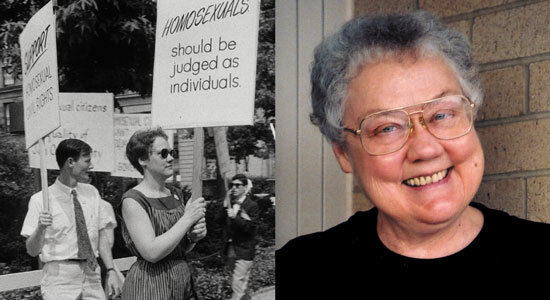 Barbara Gittings (1932–2007) was a Gay Pioneer and the mother of the LGBT civil rights movement. In the 1960s she resided in Philadelphia with her partner, Kay Lahusen. 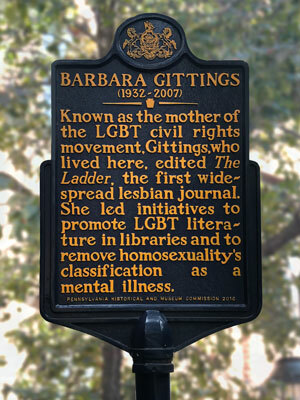 During that time, Gittings was the editor of the first lesbian publication. With fellow activist Frank Kameny, Gittings helped organize the first public demonstrations for gay and lesbian equality. Known as Annual Reminders, the protests took place in front of Independence Hall each Fourth of July from 1965 to 1969. Kameny and Gittings also waged a multiyear challenge of the American Psychiatric Association, resulting in the removal of homosexuality from the list of mental illnesses. Working with the American Library Association, Gittings successfully crusaded to include gay and lesbian literature in the nation's libraries. 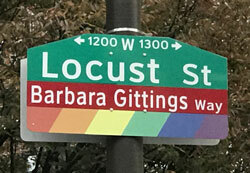 In 2012 Philadelphia officially named the intersection of 13th and Locust Streets "Barbara Gittings Way."